We consider ourselves fairly adventurous and international eaters, but you don’t see any of those countries heavily represented on the North American dining scene. If we’re being completely honest, all of those countries and their respective local delicacies had a great big question mark above them before we left, but perhaps the one about which we were the most in the dark was what we would be eating when we hit the Philippines. Despite having Filipino neighbors in Toronto, we didn’t know much about the kind of food we would find there, apart from springrolls (is there anywhere in Asia where you can’t find them?) and some fried noodle dishes (ditto). Then again, when even the man who is arguably the biggest world foodie, Anthony Bourdain, finds himself completely ignorant about Filipino cuisine, you can’t really beat yourself up too much about your shared culinary blindspot, can you? We tried to do our due diligence before arriving, watching Bourdain’s No Reservation’s tour of the country to whet our appetite, even checking out Andrew Zimmern’s episode of Bizarre Foods featuring the Philippines as well. That last one was probably a mistake, because although we find it highly amusing, it rarely features dishes that we find ourselves craving. It seemed we would just have to blaze our own trail when we arrived and find out for ourselves exactly what Filipino food was all about. 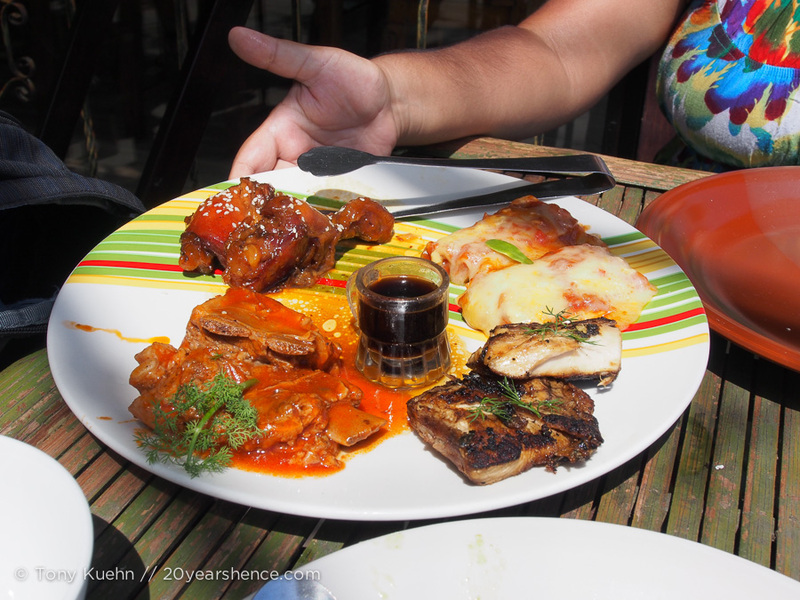 Now is about the time when I would post a round-up of what we ate in Bohol, but what we found was that Filipinos love them some barbecued meat (generally pork or chicken) and rice. And so we ate a lot of that, and at the risk of boring you with food pictures, we figured no one needed to see 5 days worth of pictures of grilled meat and rice. Besides, we have to save something for the remaining 42 days we were in the country… 😉 Instead, I’ve decided to post the best & worst things we ate while on the island, and will allow you to use your imaginations to fill in the gaps, since the meals not pictured were very likely charred meat with rice. In researching Bohol, we stumbled across several rave reviews of one particular restaurant on the island, a place called Bohol Bee Farm. In actuality, this place is not just a restaurant, but a resort too… Of course, it’s one of the swankiest digs in town and while we couldn’t afford to actually stay the night there, we did spring for a meal there. We had read with great excitement about their amazing all-you-can-eat buffet lunch, so we were somewhat disappointed when we arrived and discovered that the buffet has been discontinued for groups smaller than 6, so instead had the prix-fixe platter lunch. 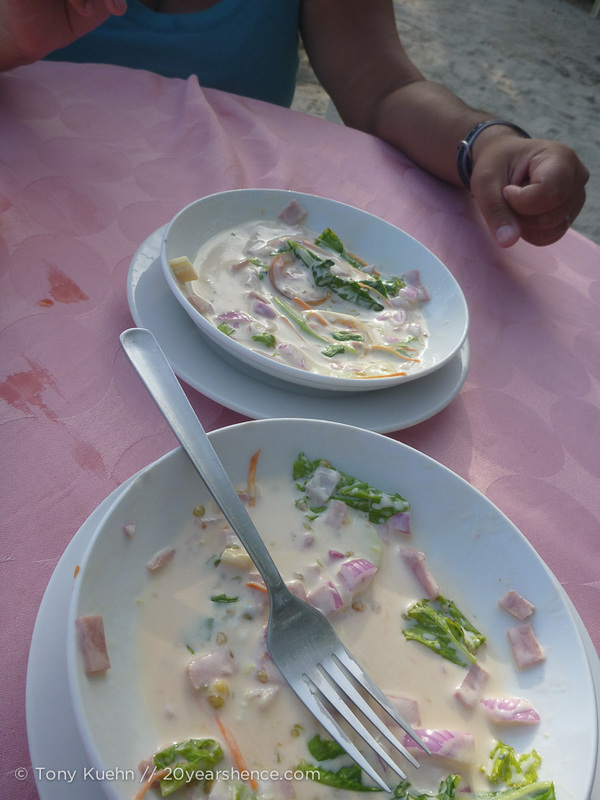 We paid 605 PHP (~$15USD) per person, which was by far the spendiest meal we had while in Bohol, but sometimes that old chestnut that you get what you pay for turns out to be true. What we wound up with was a true feast! 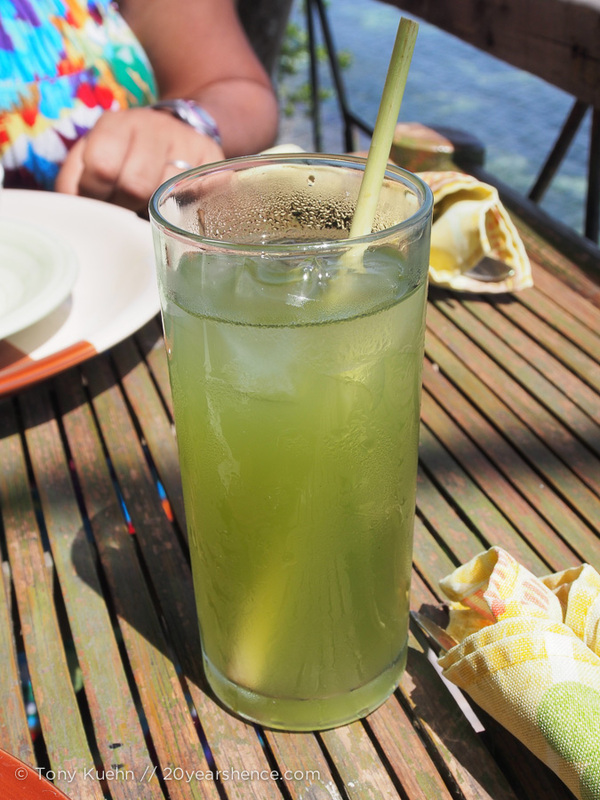 We washed down all our food with the most refreshing glass of lemongrass tea—I am a lemongrass devotee and can never get enough, so this was truly a delight! Overall, the portions of the individual items were a bit meager, but with so many dishes, they all combined to form a very hearty (but not overly heavy) meal. 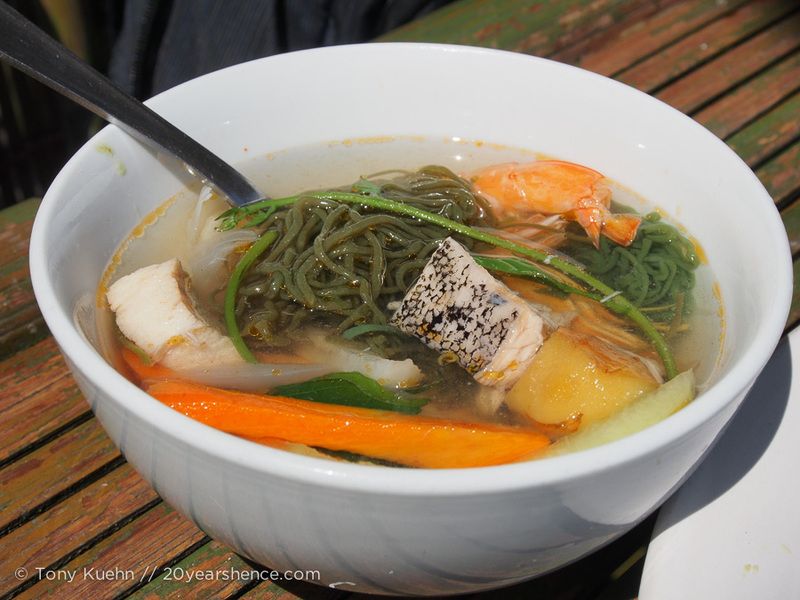 This was by far the most ambitious food we had tried since landing in the Philippines, and it was largely successful (our swordfish was a bit dry, and some of the pieces of fish in our consommé still had the pin bones in them… never a nice surprise!). I would say the biggest disappointment about our meal was not in the food itself, which was really very satisfying, but in the service we received. It felt very rushed and like we needed to get through our meal as quickly as possible, even though there were plenty of open tables. Although the Bohol Bee Farm is very much a chic resort with very beautiful surroundings, it does have something of a compound feel, and so while I would never want to stay there, I did want to feel as though I could linger over my meal and soak in the surroundings. For those who may find themselves in Bohol, this place would definitely provide a very luxurious, relaxing stay, one where you would catch sight of something beautiful everywhere you turned, but also know that the resort has no beachfront (just a very rocky, albeit beautiful, shoreline). I had read reports from others who had claimed that after dining at Bohol Bee Farm they had been able to go laze on the sunchairs overlooking the ocean, but that area was limited solely to guests of the resort when we dined there. So, instead we amused ourselves by wandering through the gift shop and trying all of their free samples (including coconut wine… which smells—and tastes!—like nail polish remover) before we left. That’ll show them! I know I smack talked Filipino BBQ in my intro, so it might come as something of a surprise that I’m featuring this roast chicken as our second best meal on Bohol. Especially since I already mentioned it in an earlier post. But seriously, with that many people devoted cooking meat on an island, someone is bound to get it right. 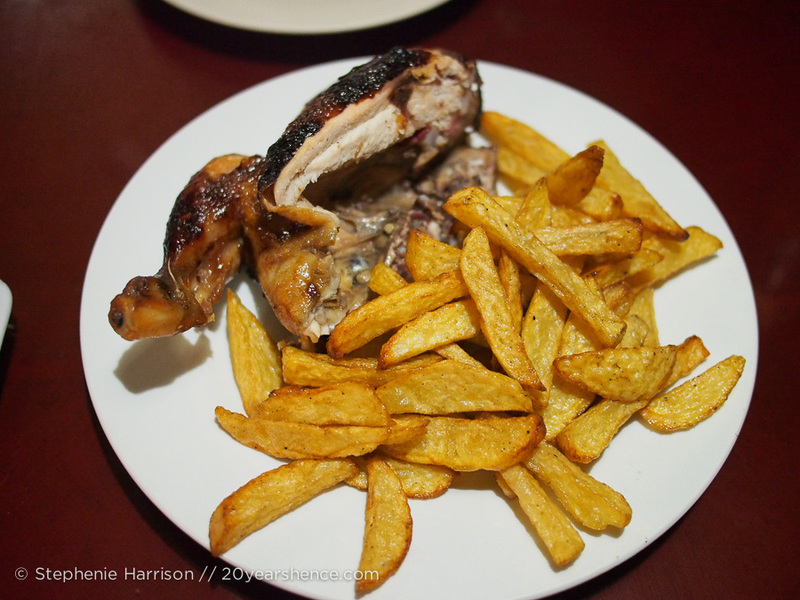 This chicken was so juicy and delicious, we still speak of it wistfully months later. The folks over at Living If claim that the Philippines has the best chicken in the world; after eating it here, we’d be inclined to agree! Though most of the dishes that Tony Bourdain chowed down on while in the Philippines aren’t ones we’d be rushing out to order any time soon (bile soup, anyone? 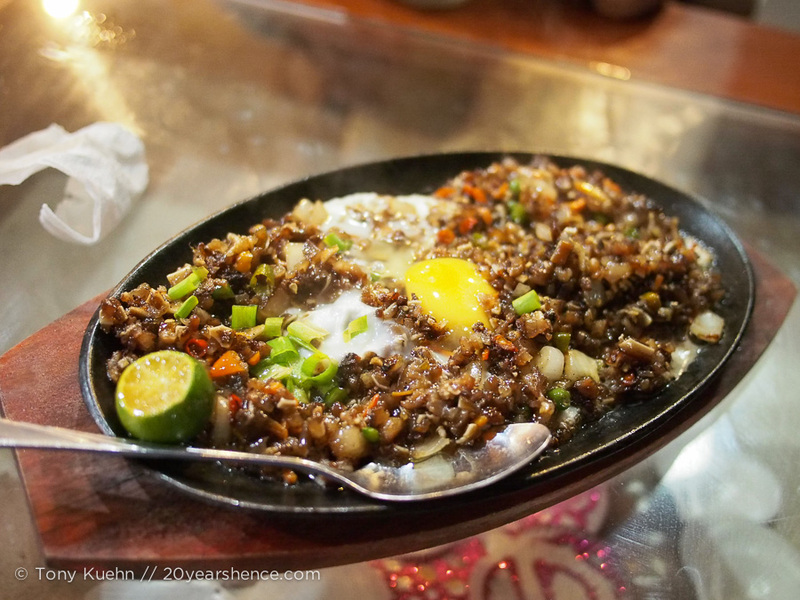 ), one dish he tried did leave us intrigued: sisig. Sisig is a dish that is made up of chopped pieces of pig’s head (and sometimes parts of liver too) that are fried until they are golden little pork nuggets. It’s presented on a sizzling platter, and is sometimes topped with a fried egg. Of course this is how we ordered it, though Tony also (foolishly) ordered our sisig spicy as well. For such tiny peppers, this was a HUGE mistake. Generally speaking, the tinier the chili, the more power in its punch, and with just one bite our mouths were on fire. We found the spiciness pretty unbearable and even a bit painful. Even more disappointing is that apart from lip-blistering heat, we found that when we picked around the devil peppers in the dish, there just wasn’t much flavor. Then again, maybe our tastebuds had just been annihilated… Either way, we never thought we’d meet a pork dish we called bland, but take away the heat and this might just be the one. I’m one of those annoying people who likes to eat well-balanced meals. While some travelers might be happy to munch down on ramen and fries for every meal, I like to eat veggies every day or else I start to feel really unhealthy. It would seem that many Filipinos do not share this opinion, as vegetable options are few and far between on most menus. True story: we once saw spaghetti with meat sauce offered under the “vegetarian” portion of a menu. With this in mind, while dining beachside one day, I decided to opt for a set meal because it came with a salad. In Japan I once ordered a set meal because it came with a dessert, so this was something of a step up! Or so I thought, until I actually received said salad. It was positively swimming in dressing. I would say the bowl I received was 65% dressing, and only 35% actual vegetables (and eggs and ham… seriously, they are incapable of understanding what “meatless” means here). And of course it was 1000 Island (though this being the Philippines, I guess maybe 7000 Island would be more appropriate) dressing, so was ridiculously sweet and thick. 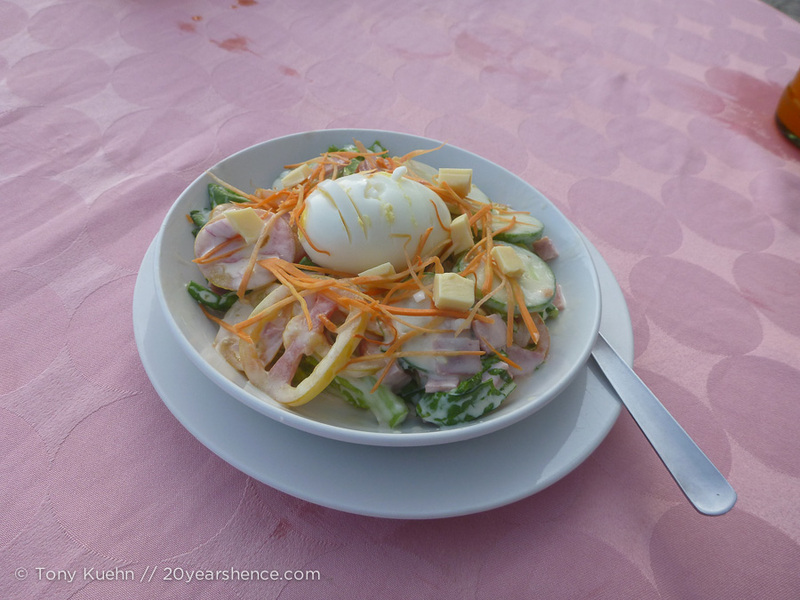 I never ordered another salad again while in the Philippines as this was more than enough to last our entire trip, but if I ever wish to brave one again, I’ll definitely ask for it to come with the dressing on the side! 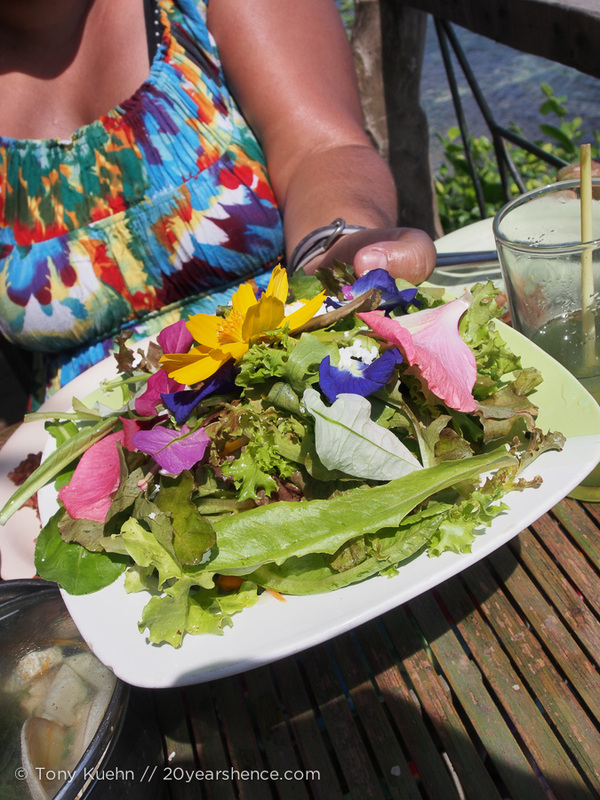 That last salad would put me off ordering salad again, but the one with the flowers was definitely fresh and healthy. I wonder why they would not let you have the buffet. What would it matter if your party was less than 6? The mysteries of eating on the road. The salad you got is actually pretty typical in some parts of the world. When my ESL classes had dinners a couple of times each semester, this is always what the salad looked like. It resembled a very wet cole slaw more than anything else. I’m not so much a fan. P.S. I like the new layout (though I liked the last one, too), but I’ve had issues commenting. Something seem to be off with commentluv. Ugh, I am so sorry you have also experienced the drowned salad. Not only is it artery-clogging gross but it makes everything all soggy… that’s ok for something like a potato salad which is meant to be soft (and cole slaw is its own weird beast! ), but if you’ve got lettuce in something, I want that crisp! I like edible flowers! 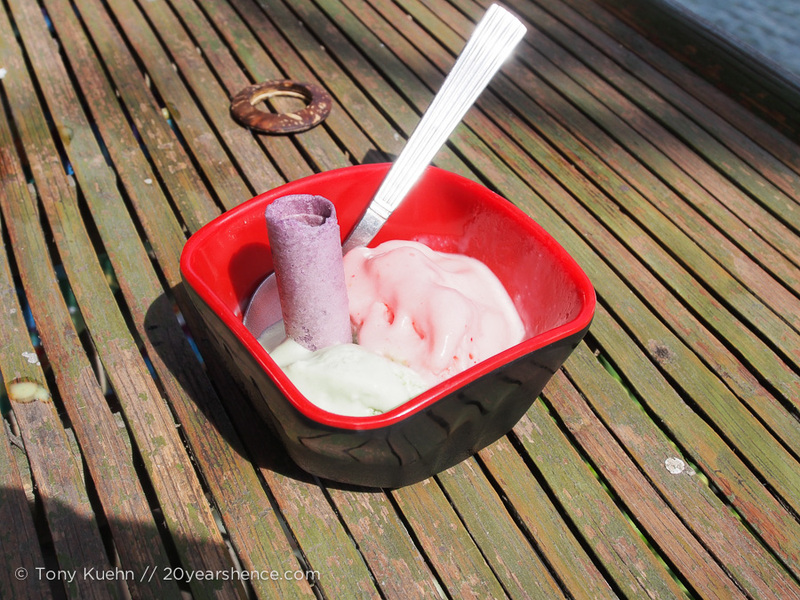 And pandan ice cream. Good salads were tragically hard to find in Asia. Yes, edible flowers & pandan are both delightful. And normally I would never order a salad (let alone make one myself), despite my love of veggies, but when you go prolonged periods without fresh produce (and you do in the Philippines, though they do have some excellent fruit), it makes you get a bit daring with your ordering. Never again! It’s been too long since I had a salad last, but even seeing this one swimming against the current has got me hungering for one. I guess every cuisine has it’s ups & it’s downs, and it seems like the Philippines is no different. I just don’t know how much roasted & friend meat I can handle in thirty days. Also, we have this theory the really good Filipino chefs actually leave the Philippines to work elsewhere, so who knows, maybe Mike was right! Elle-Rose Williams recently posted..A few words about this beautiful place. Queenstown. For sure! Some of the places we were most excited to visit on this trip were ones we actually knew nothing about in terms of the food; we were excited to get to discover completely new cusines! It’s generally pretty hard for us to like a place if we don’t also like the food, but in Asia, bad food seems to be the exception rather than the rule. I am de-lurking long enough to say how much I am loving your food posts and pictures. One of the top three finalist on the latest season of Top Chef is a Filipino-Hawaiian who introduced viewers to lots of those influences. Having lived in Hawaii for two years I probably have tasted more Filipino food than most, but still not much. Thanks for weighing in, Thaoms! Obviously we have not been able to catch the most recent season of Top Chef, but I’ll look forward to seeing it now! 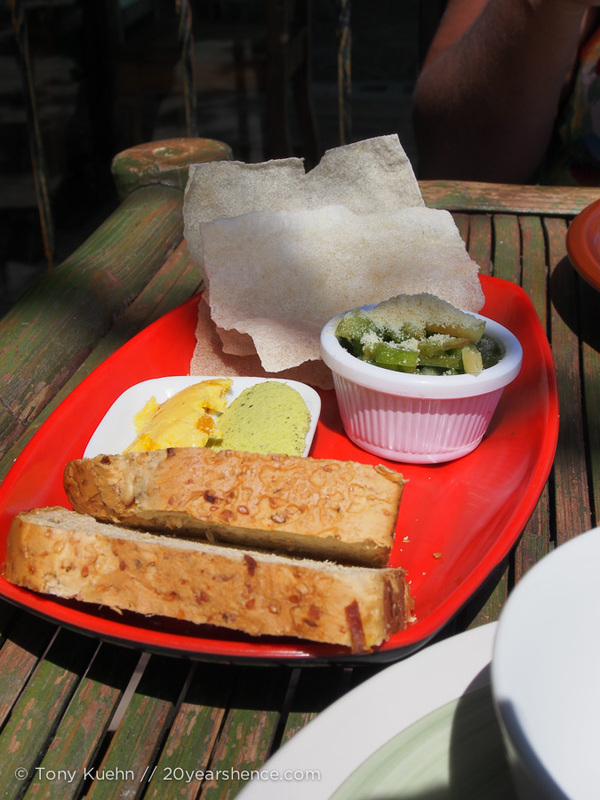 Maybe some of the dishes will look familiar to us… certainly they will make us smile, I think! It really was a nice soup and was pulled off with a good degree of finesse, which I really appreciated! There are two kinds of salads that drive me crazy: ones that are drowning in dressing (as seen here), and ones in which “salad” means just a few leaves of limp lettuce and nothing more. HATE!